Our special Mother's Day promotion is now running. $20 Off and FREE SHIPPING on all orders of $129 or more. Shop our spectacular new Mother's Day catalog and find the perfect gift for your mother or loved one. 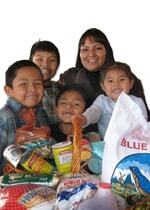 Just as wonderful: every purchase you make helps us help Native Americans!